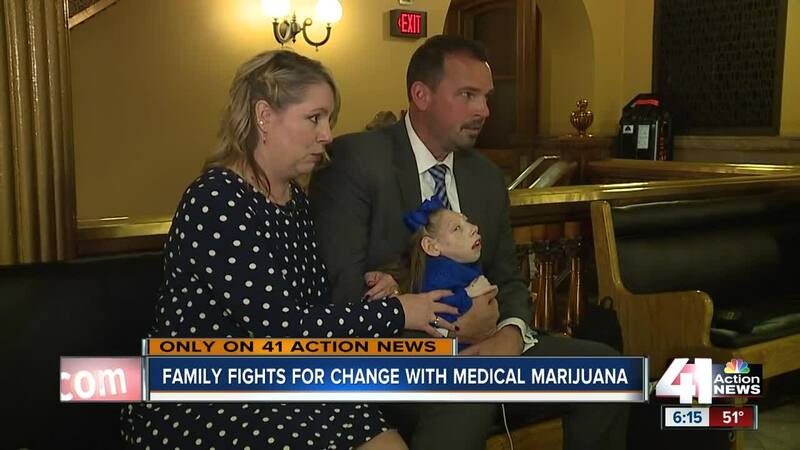 TOPEKA, Kan. — One Kansas family is fighting for an exception in state law that could help save their daughter's life. Low THC oil is illegal in Kansas. On Tuesday, a Wichita family traveled to Topeka to testify before lawmakers about making an exception to the law. Gwen Hartley's daughter, Lola, is 12 years old and has microcephaly, cerebral palsy and dwarfism. She only weighs about 14 pounds, her mother said. Hartley said she and her husband, Scott, are willing to make the seven-hour trip to Colorado to get low THC oil to help Lola with her seizures. But if she brings the THC oil back into Kansas, she could be arrested and her daughter could be taken from her under current state law. Proposed legislation in the Kansas House, House Bill 2244, would allow parents to travel to Colorado to get THC oil and bring it back into Kansas legally. Low THC oil is derived from the marijuana plant but contains small amounts of THC, the psychoactive canniboid that causes a high. Gwen and Scott Hartley have already lost one of their daughters, Claire, due to the same medical problems that Lola experiences. "Her big sister Claire passed away in December," Gwen Hartley said. "We started this process with her. The goal was to do it for both of our girls and give them the best life that we possibly could." The House Judiciary Committee heard the bill on Tuesday. Two Kansas City-area lawmakers sit on the committee. "I like to hear the pros and cons, the unintended consequences that might come up if we change policy in Kansas,” said Rep. Kellie Warren, an Overland Park Republican. Another lawmaker on the committee said she will closely consider the bill. "I am definitely willing to consider anything that will help children...the time has come, we need to take a close look at that,” said Rep. Pam Curtis, D-Kansas City, Kansas. The Kansas Bureau of Investigation said that it does not support the bill.